The Distil Showcase will return again to the Tolbooth in Stirling on Friday 6th April 2018 at 8pm. The concert showcases the new and exciting music of traditional music composers. We are very lucky to have Mr McFall’s Chamber as our resident house band once again. You can buy tickets for this fab night of music here! Graham Mackenzie has written music called The Falls of Clyde. Here’s some information about it. My piece is inspired by the Distil weekend at Lanark where my thoughts were drawn to the 18C mill town New Lanark, and how it’s people and industry were powered by the waters of the River Clyde. This is music composed during the heavy rains of Autumn which depict the force and the flow of the river, its passage through the falls and its driving of the wheels and machines of a special place, recognised as a world heritage site today. 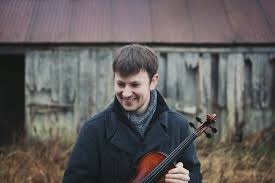 The Falls of Clyde is written for solo fiddle and string quintet and is based around an E minor traditional jig. The piece also includes a slow opening melody and fragments of a reel throughout. The frequent changes of tempo convey the unpredictable course a river may take. I have explored many ways in which the string quintet can accompany traditional tunes in ’The Falls of Clyde’. You can read about all the composers here.